BARLOW TYRIE - This outdoor dining set features pieces from Drummond, Monaco and Reims and will make outdoor dining a summer staple. Summer is here and dining alfresco is one of the greatest joys of the season. Gatherings come in all shapes, sizes and locations, from a large formal dinner on a bluestone patio to a casual backyard cookout on the deck or even something more intimate—relaxing solo in the garden with the latest page-turner, a glass of wine and a swaying hammock. Wherever the entertaining happens it centers around a patio set that extends a home’s décor outside. Before hitting the stores, use this cheat sheet to find the one that will entertain for years. Wood, metal, stone and plastic are just a few of the materials being used and all require some degree of maintenance. Increasing summer temperatures and unpredictable storms can take their toll, it’s important to be realistic about the upkeep that will be required. Redwood, teak and cedar are expensive woods that weather beautifully, however “all woods will change color with time and exposure to the elements,” said Robert Shapiro of Brooklyn-based Balsera Woodworks. “You’ll need to recoat yearly with a waterproof sealer. Teak is really the gold standard for outdoor furniture. After all, it’s used to make boats.” Acacia, eucalyptus and bamboo are less expensive and also wear well outdoors, but ultimately, limiting exposure to the elements is the best way to prolong the investment. It’s why Beth Donner, of the Huntington-based design firm, likes adding drapery around the perimeter of a pergola to keep direct sunlight from prematurely aging the wood. Sets in powder-coated metal also come in a range of prices—and for good reason. Wrought iron is strong, withstands the elements and comes in endless styles, but it can be expensive. And it’s heavy, which is a big plus if the home is located in a windy coastal area, but not so great if the furniture is on grass. Aluminum is very popular and also versatile. It doesn’t rust, but lacks the heft of wrought iron. Wicker offers a unique look—retro and a little romantic—and the new synthetic-resin versions are much more impervious to the weather than natural rattan, which can split and crack over time. Plastic is the most budget friendly option and it can be molded to imitate wood grain, wicker and even wrought iron. 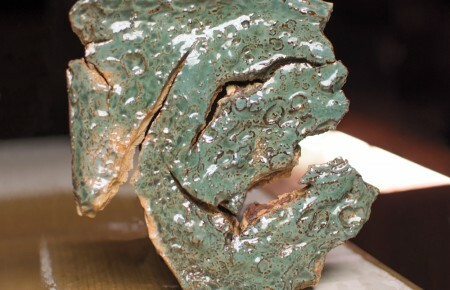 Spills clean up easily, but the hollow constructions lack durability and may need to be replaced every few years. A shatter and scratch resistant tempered glass tabletop is available with just about any set. While it gives a lighter look, it may not be the best choice for a family with young children or worth the cost if tablecloths will often be used. Rhode Island-based designer Maria Aureli has designed outdoor entertaining areas for years and has a different take. “I’d match a shingle-style house with a teak table and chairs, but add contrast with bright fabric cushions. I like to use blues and greens if the table is near the pool and earthy colors if it’s in a garden setting,” she said. She likes a rectangular table if it’s located on a deck because it has a more dining room feel to it. “If you regularly host dinner parties and invite a lot of guests, rectangular will give you more room at the table.” For these occasions, Aureli suggests adding a crisp white linen tablecloth for a special touch that makes the tableware really pop. The designers all agree that one of the most important elements is lighting. Aureli suggested repurposing an old chandelier by replacing the lights with candles and hanging it above the table (if it’s under a pergola). Thornton offered another direction. “I find beautiful lanterns, remove the candles and take them to an electrician to have them hardwired,” she said. “I like the consistent light and glow from bulbs.” And Donner prefers the look of candles (real or LED) flickering in large floor lanterns for a touch of drama and flare. There are many ways to accessorize, one of the easiest being with cushions, both for comfort and for style. Sunbrella and other makers of weather-resistant fabrics have a wide variety of colors, patterns and textures. For older sets, replacing the original cushions can refresh the design. These textiles are waterproof, require little care, and can be easily cleaned with just a quick swipe of a sponge. 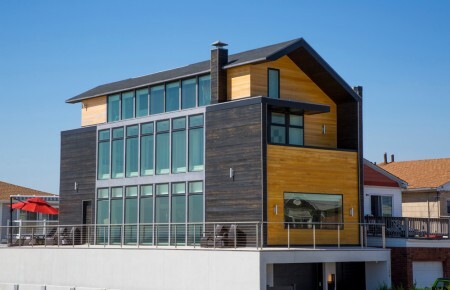 When positioned close to the house, another way to bring in color—and much-needed shade and protection from the elements—is with a retractable awning. 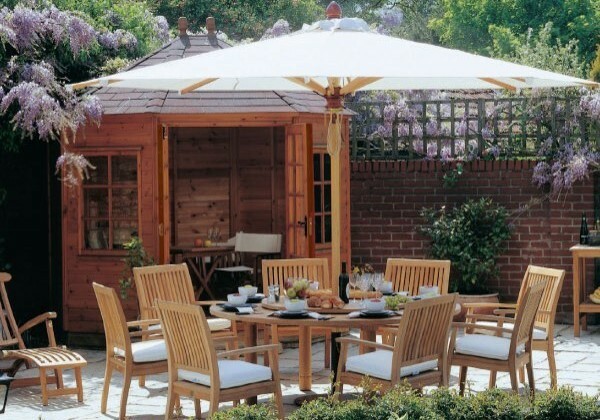 For those further out into the yard or near the pool, an umbrella is more practical and there are many table styles that are made to incorporate one. Extra greenery can make these areas more welcoming too. Aureli suggests using colorful, oversize pots planted with elephant ears, jasmine or begonias for a garden feel, especially on a balcony or an area without much foliage. The days of rickety lawn chairs and make-do tables are a thing of the past. 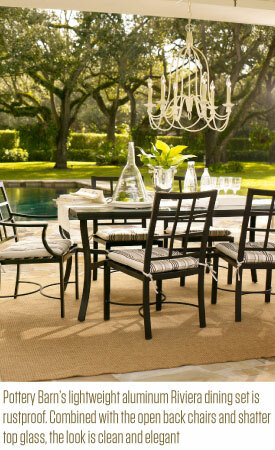 The patio set has become a chic addition to any home, no matter where it’s placed.